Background: Previous studies found that 40-60% of the sarcoidosis patients suffer from small fiber neuropathy (SFN), substantially affecting quality of life. SFN is difficult to diagnose, as a gold standard is still lacking. The need for an easily administered screening instrument to identify sarcoidosis-associated SFN symptoms led to the development of the SFN Screening List (SFNSL). The usefulness of any questionnaire in clinical management and research trials depends on its interpretability. Obtaining a clinically relevant change score on a questionnaire requires that the smallest detectable change (SDC) and minimal important difference (MID) are known. Objectives: The aim of this study was to determine the SDC and MID for the SFNSL in patients with sarcoidosis. Methods: Patients with neurosarcoidosis and/or sarcoidosis-associated SFN symptoms (N=138) included in the online Dutch Neurosarcoidosis Registry participated in a prospective, longitudinal study. Anchor-based and distribution-based methods were used to estimate the MID and SDC, respectively. Results: The SFNSL was completed both at baseline and at 6-months’ follow-up by 89/138 patients. A marginal ROC curve (0.6) indicated cut-off values of 3.5 points, with 73% sensitivity and 49% specificity for change. The SDC was 11.8 points. Conclusions: The MID on the SFNSL is 3.5 points for a clinically relevant change over a 6-month period. 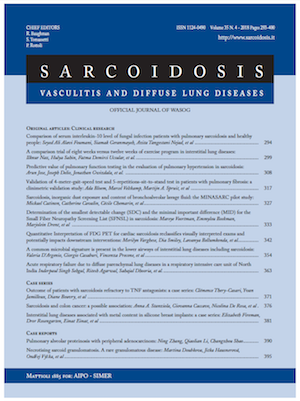 The MID can be used in the follow-up and management of SFN-associated symptoms in patients with sarcoidosis, though with some caution as the SDC was found to be higher.